We are a noteworthy name when it comes to Nepali Shatavari Plants that is the perfect outcome of premium material and advanced processing techniques. As a dependable name, based in Udaipur(India), we make available qualitative lot to every nook and corner ensuring maximum client satisfaction. Cultivation : Shatavar is common throughout the tropical and subtropical regions, particularly central India. It is also found up to an altitude of 1500 m in subtropical Himalayas. By nature, the plant is xerophytic and prefers the semi-arid to subtropical, cool environment. Climate and soil : Soil – black, well drained andfertile soil is good for cultivation. But can be cultivated in loose and medium black soil.Climate- crop responses well to tropical and hot climateThe plant prefers annual average rainfall of 600–1000 mm or less, of which 85% is received during July to September. A well-drained fertile sandy-loam to medium black soil, with a pH of 6–8 is best suited for its cultivation with staking support. Shatavar can be grown in open land as well as under shade, but very high moisture levels result in rotting of root. Propagation material : Both seeds and root stumps can be used for propagation. However, seeds are preferable on account of high production that makes up for low germination percentage in cultivation. Seeds may be collected from March to May when their color changes from red to black. Raising propagules : Seeds are sown during the April -may in well-prepared and raised nursery beds containing good amount of FYM (farmyard manure). The beds should ideally be 10 m × 1m in size. Seeds are sown in lines 5 cm apart and covered with a mixture of FYM and soil. The beds are lightly watered at regular intervals using a rose water cane. Propagule rate and pre-treatment : About 7 kg of seeds are required for raising seedlings for 1 hectare of crop. To obtain early and higher germination percentage, presoaking in water is required. Higher germination is also achieved by soaking the seeds in cow urine for 24 hours. The germination commences after 20 days of sowing and is completed in 30 days. Land preparation and fertilizer : The land should be given a deep disc plugging, followed by harrowing and leveling. The field is normally divided into plots, keeping one irrigation channel in between two rows of plots. About 10 tones of well-decomposed FYM are thoroughly mixed in the soil one month before transplanting. Shatavar. A fertilizer dose of 40 kg nitrogen, 20 kg phosphate, and 20 kg potash per hectare may be applied for better growth and higher tuberous root yield. One-third of nitrogen and entire dose of phosphate and potash should be placed 10–12 cm deep in the rows before transplanting. Transplanting and optimum spacing : The seedlings are ready for transplanting after 50-60 days of sowing. These are transplanted in field at the onset of monsoon in July. Keeping the plant-to-plant distance at 60 cm. Optimum number of seedlings required per hectare using the recommended spacing is about 150 000. Intercropping system : Shatavar is normally grown as a monocrop, but it can be grown in inter spaces available in orchards having low light interception. Plants need staking material, thus poles or shrubs serve for support. The field is irrigated immediately after planting if there are no rains for 2-3 days. Shatavar can be grown in rain-fed condition as well as irrigated. On availability of irrigation water irrigation at the interval of 25-30 days may be given. Frequent weeding is required during its early period of growth. Care should be taken to avoid any damage to growing shoots at the time of weeding. Totally, about 2-3 hand weeding is needed to keep crop free of weeds. Intercultural and maintenance practices : The balance two-third N is applied in two equal split doses during September and in late February. The fertilizer is broadcast in between the rows and mixed in soil Followed by irrigation, if the soil is dry. Shatavar initially grows slowly for 60 days, which keeps inter-row space virtually vacant, allowing easy weed growth. It is necessary to carry out weeding and hoeing operations to keep the field free from weeds for initial two-month period. After two months, Shatavar grows enough to cover the inter row spaces and prevents weed growth. Disease and Pest Control : No serious insects, pests, and disease have been reported in this crop. Plant Protection : No serious pest and disease has been noticed in this crop. The crop matures in 18 months after planting. Rabi season, that is, November– December, is the best time for harvesting tuberous roots when the above-ground parts start turning pale yellow. The crop, when harvested in 18 months, yields about 4–5 tones/hectare, while harvesting after 20 months yields about 6tones/hectare of tubers along with 35 kg hectare of seeds. Yield and Cost of Cultivation : The tuberous root yields 15%–20% of dry matter after removal of outer wall. An average shade-dried tuberous root yield of 4-5 tons per hectare is obtained from 18-month-old plants under experimental conditions. 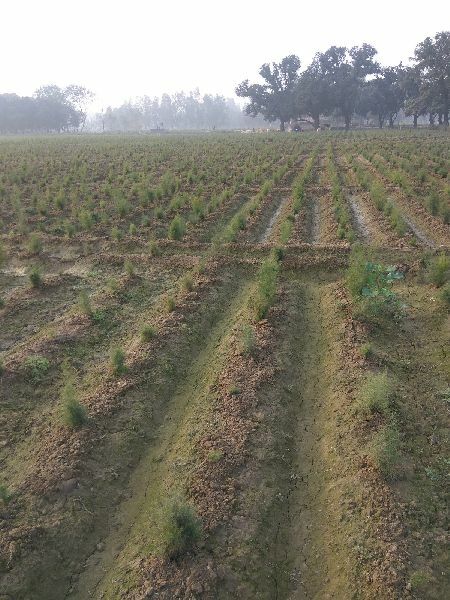 Including land preparation, nursery rising, cost of planting material, FYM, cost of transplanting, harvesting, peeling and processing for market, and so on. The calculated yield of 18- month-old crop of Shatavar is 4-5 tones/hectare, which can fetch net returns of approximately Rs 1-1.25 lacs/hectare. Post Harvesting : The harvested toots are thoroughly washed preferably in flowing water, Thereafter, inner woody threads are removed by splitting the roots. The thin root barks are removed by scraping with a knife or incising them. In the traditional method, the roots are also kept in a bamboo basket on a pot of boiling water for five to ten minutes to facilitate easy removal of thread and root bark. But this method is really not required when freshly collected roots are peeled off. The roots are then dried in the shade for 8-10 days. The fresh roots lose about 90% of their weight after peeling and drying. In case of delay in peeling, it becomes extremely difficult later on. Value addition of root powder enhances marketability and sale and price. The roots get damaged within 3 to 4 months if threads in not immediately removed.